This is Frances. I designed this beautiful cardigan during one of the busiest times of my life getting A Stitch in Time Vol 2 ready for publication. 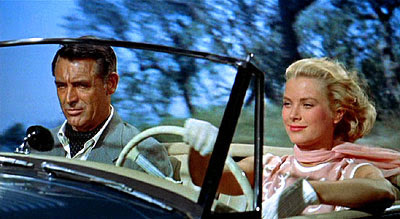 Yet instead of being a burden it was a wonderfully, liberating adventure. After being immersed in vintage patterns almost constantly it was such a release to be able to start with the proverbial blank canvas and create an original design. Frances was originally designed for The Knitter magazine but she's now returned to me and is available as a PDF download for £4.00 either from the knitonthenet shop or from ravelry. 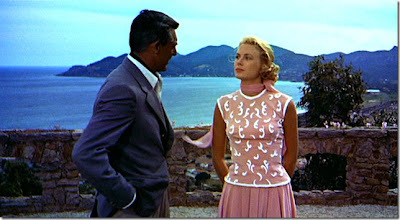 Base on the classic 1950s hip length, figure hugging sihouette, I named the cardigan after Frances Stevens in To Catch a Thief played by Grace Kelly. Frances is so effortlessly sophisticated and elegant throughout the film - just like her namesake cardigan. All Grace lacked in these shots is a cardigan over her shoulders! The Lattice Stitch pattern used is worked using negative ease so that the wearer stretches the garment to fit and shows off the beauty of the stitch. I've become more and more fascinated with negative ease and I feel that this design really shows how it can make a stitch come to life. It also gives structure and shape to the wearer, a bit like support garments of old but without the feeling of restriction! I used Excelana 4ply in Nile Green with the facings and hems in French Rose for contrast. Excelana has such amazing stretch and recovery as I've said before, which makes it perfect for this type of design that really needs these qualities from the yarn. The facings and hems are knitted as part of the main body of the garment so other than the neckband there's no picking up stitches. You can see a little peek of the contrast hem on the cuff in this photo. The pattern comes in a range of sizes from 28 inches (71cm) to 50 inches (127 cm) and uses between 7 and 14 balls of Excelana in the main shade, and 1 ball of the contrast colour. The hems are knitted using 2.75mm needles and the main body is knitted using 3.75mm needles. You also require 8 buttons. These particular buttons are not vintage but have a vintage feel to them. I realise 8 matching vintage buttons can be hard to get hold of so I think a compromise is just fine. And finally, there is a code included with the pattern that offers a discount on Excelana. I really love this pattern and I hope you do too. 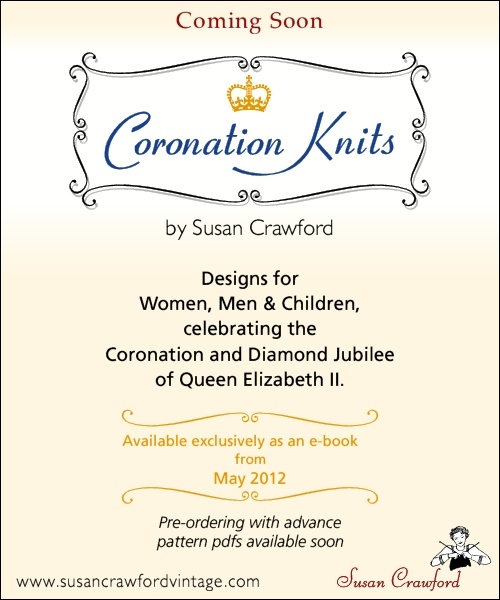 I am so excited to be able to announce the publication of this collection of designs inspired by and celebrating the Coronation of Queen Elizabeth II 60 years ago. This small collection will feature designs for women, men and children and will be available an e-book but not in print. I will announce price, number of patterns, and how to order etc very, very soon.